The high performance Coolshot cold runner system allows the process-reliable and efficient processing of various types of LSR. As a key technology the system features the technologically leading Ewikon electric drive valve gate system which already has been successfully used for years in hot runner applications worldwide. When processing LSR the electric step motors used allow the positioning of the valve pins with high precision in steps of 0.01 mm and thus a perfect fine-balancing of the cavity filling. Since no manual adjustment of the valve pin length is required the expenditure of time for system setup and re-adjustments during production is considerably reduced. Furthermore, the advanced control technology allows permanent monitoring and automatic adjustment of the valve pin positions by using encoders. The touch screen panel offers a comfortable operation of the system and also features remote control access by using a tablet PC (iOS, Android, Windows) with VNC viewer. All components of the system are designed for maximum reliability and easy maintenance. The manifold system features a fully balanced flow channel layout without dead spots for quick colour changes and can be easily dismantled and opened for cleaning. Depending on the LSR type used the water-cooled cold runner nozzles are available with different material combinations in the gate area. Thus, the thermal separation can be tailored to the process. This allows to always produce with the optimum mould temperature and with reduced cycle times. Two additional options help to further enhance process-reliability and maintainability. On request a heated separator plate with powerful coil heater and separate temperature control for each cavity is available. This heating principle is a proven technology from the hot runner field and enables a particularly even heating of the mould plate for homogeneous cross-linking of the LSR. 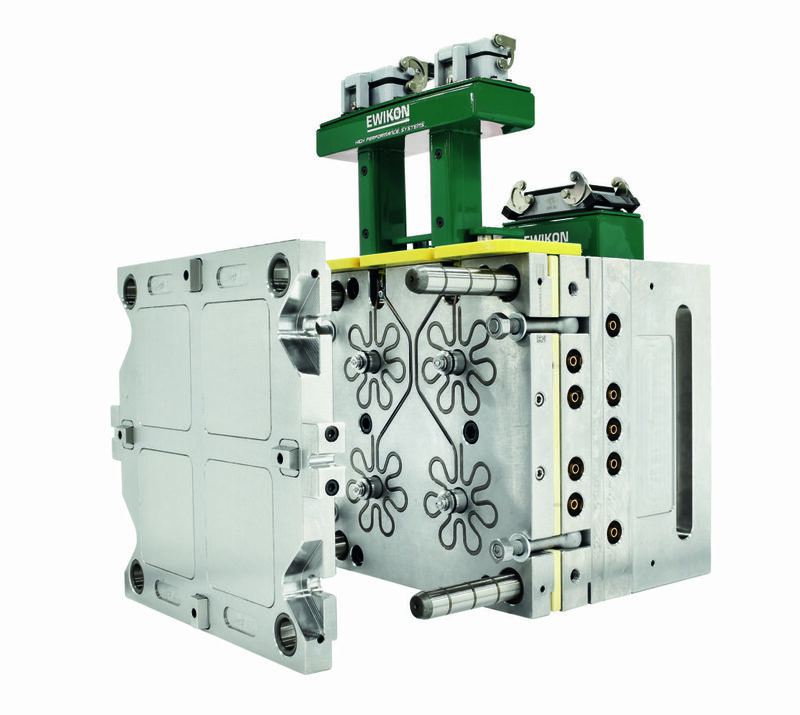 The cavity plate itself can be equipped with an additional mechanism to easily separate it from the cold runner nozzles after the end of production or in case of a temporary interruption. This stops the heat transfer from the hot cavity plate into the gate area of the nozzles and prevents a cross-linking of the LSR in the cold runner. The COOLSHOT system is delivered as complete cold half with pre-installed cold runner system, cooling and complete electric wiring and can be easily integrated into the mould. With the introduction of smartControl Ewikon takes a further step towards industry 4.0. smartControl is a compact process monitoring and diagnosis unit for hot runner moulds which monitors, analyses and logs all relevant process and system parameters over the entire life cycle of the mould. All information on the installed hot runner system is contained. Relevant data such as running times and downtimes of the mould, nozzle and manifold temperatures of the hot runner system as well as shot numbers are permanently collected and logged. When defined critical values are exceeded a warning signal can be triggered. The compact smartControl unit is attached to the outside of the mould or to the wiring box. All data can be exported by using WLAN, Bluetooth, Ethernet or USB. A brower-based user interface which has been developed by Ewikon allows a clear visualization of the data and can be installed on mobile devices as well as in company networks. In case of system errors the data can be transmitted to Ewikon for quick remote diagnosis. This allows an early initiation of specific maintenance activities and minimizes the downtime of the mould.